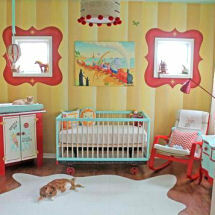 There is much to love about a sock monkey baby nursery theme. Fans of this soft,loveable toy can't wait to design a room for their baby girl or boy filled with items that most likely bring back memories of their own childhood or perhaps their own special toy, a treasured keepsake that was perhaps made by loving hands belonging to a grandmother or dear friend who has long since passed away. 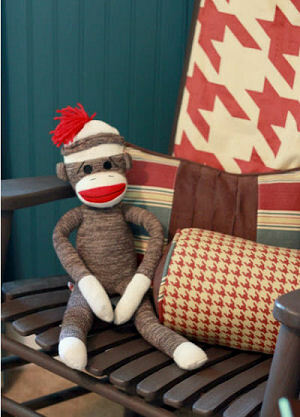 A beloved, handmade sock monkey waits patiently for mom and baby to join him in the rocking chair for storytime and a snuggle. A rust and ivory throw blanket is draped over the back of the rocker ready to provide warmth on the occasional cool evening. Pillows in various shapes and sizes offer support for a mother's back at the end of the day. Many consider our friend, the sock monkey, to be a theme in and of himself but this crafty little fellow has a knack for re-inventing himself. 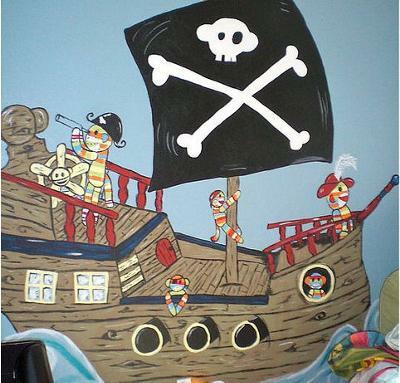 With the addition of a few airplane nursery decorations you can create a "theme within a theme". 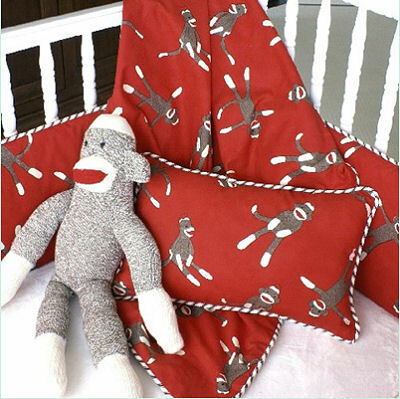 Consider a sock monkey airplane nursery theme created with a few strategically placed throw pillows and receiving blankets embroidered with the image of our hero playing the part of a WWII Pilot flying his plane for your baby boy's entertainment. And if the idea of monkeys flying airplanes doesn't tickle your fancy, perhaps the thought of them as sailing on the ocean as captains of a pirate ship will do the trick. Please make plans to visit us again soon to see the latest in sock monkey baby nursery decor as well as other vintage toy baby nursery ideas. 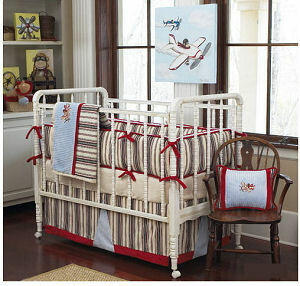 Do you have a great set of sock monkey baby bedding or a picture of a nursery that you decorated? Share it!